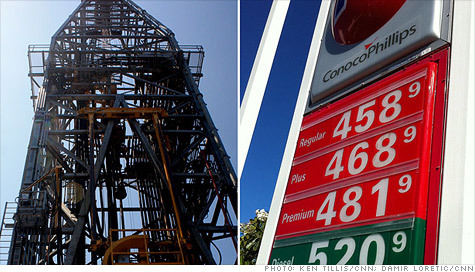 NEW YORK (CNNMoney) -- Every time gas prices reach record highs the call goes out for more oil drilling. This year it's no different. "The Gulf is ready to get back to work to help create jobs and lower gasoline prices," Washington Republican Doc Hastings, head of the House Natural Resources Committee and a big proponent of more drilling, said last week. "This drill drill drill thing is tired," said Tom Kloza, chief oil analyst at the Oil Price Information Service, which calculates gas prices for the motorist organization AAA. "It's a simplistic way of looking for a solution that doesn't exist." According to a 2009 study from the government's Energy Information Administration, opening up waters that are currently closed to drilling off the East Coast, West Coast and the west coast of Florida would yield an extra 500,000 barrels a day by 2030. After OPEC got done adjusting its production to reflect the increased American output, gas prices might drop a whopping 3 cents a gallon, the study said. "More production from anywhere would tend to lower prices," said Adam Sieminski, chief energy economist at Deutsche Bank. "But the amount that we're talking about domestically, it wouldn't move gas prices from $4 a gallon to $3." In fact, more domestic oil is just what we've been seeing and gasoline prices are still going up. Including liquids from natural gas, biofuels and other products that are all used to make gasoline, the United States now produces 9.7 million barrels of oil a day, according to EIA. That's the most oil this country has pumped in 20 years, and puts it just behind Saudi Arabia and Russia as the world's top producer. Since 2005 production has been steadily rising. The United States now produces about a million and a half more barrels today than it did six years ago. Over this same time period oil hit a record $147 a barrel. Oddly, it's largely because of high prices that this new production is possible. The deepwater drilling, shale rock extraction and other techniques used to increase production are pricey endeavors. It's been a bounty for those that work in the oil and gas industry. In the last ten years the industry has added 2 million jobs, said Rayola Dougher, senior economic advisor for the American Petroleum Institute. The industry now employs over 9 million Americans. These are well-paying jobs. People can earn $15 to $20 an hour right out of high school. With a just a few years experience, $60,000 a year is possible. Petroleum engineers and others with advanced degrees easily clear six figures. It's also been good for oil companies. Thanks to lower taxes, companies generally make much more money on a barrel of oil produced in the United States than they do from North Sea or Middle East crude. Dougher said that if all federal land was open to oil drilling -- not just offshore but Alaska's wildlife refuge and all federal land in the West that isn't a national park -- the country could produce an extra 2.8 million barrels of oil a day by 2025. Being that she represents the oil industry, Dougher gave the idea a hard sell. She said it would create another 500,000 jobs, add $150 billion each year to government coffers and shave a significant chunk off the country's foreign trade deficit. But one argument she didn't make was lower prices. "How would that play out in the market, what impact would that have on prices," she said, "we just don't know."